PEAQ to use Caskeid technology in Munet multiroom speakers | What Hi-Fi? Imagination Technologies has announced that German-based manufacturer PEAQ is the latest to use its Caskeid technology in a new range of multiroom speakers. Earlier this year, it was confirmed that Japanese firm Onkyo had agreed a deal with Imagination that will see the pair collaborate on future wireless music streaming systems for the home. 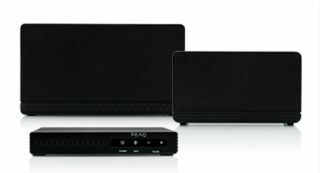 Caskeid technology, which claims to offer "outstanding audiophile-quality stereo playback", will now be used in PEAQ's brand new range of Munet wireless audio music streaming systems. All products from the Munet range will be compatible with not just each other, but with other Caskeid devices in a bid to let you benefit from the widest choices of wireless streaming products. Caskeid delivers content to multiple speakers using Bluetooth and wi-fi, letting you choose the music or radio service app you want and then sending it via a Bluetooth connection to the speaker. The Munet range from PEAQ – the brand owned by Media-Saturn Group – will initially comprise five products and lets you either synchronise playback or listen to different music in different rooms. Media-Saturn Group have also partnered with JUKE to offer a music service with more than 25 million songs, with full support for Caskeid natively available for the JUKE app. PEAQ is now the third major brand to announce it is to use Caskeid technology, with Pure including it in its Jongo range of multiroom speakers (above) and Onkyo – as mentioned above. Imagination director of cloud services Pete Downton said: "2014 may well be the year that wireless speakers really take off. "We believe that Caskeid will be a core technology behind this growth and we are delighted that the Media-Saturn Group will be a key partner in enabling the Caskeid revolution." At present, PEAQ products are not currently available in the UK but hopefully we'll see it make the leap across from the continent in the months ahead.